As previously seen on Governance & Accountability Institute's sustainabilityupdate. On May 16th and 17th, the Rutgers Institute for Ethical Leadership and Governance & Accountability Institute present the Spring 2017 CSR Certificate Program for corporate managers, not-for-profit and foundation managers, and others interested in career opportunities and advancement in the fields of Corporate Social Responsibility (“CSR”), Corporate Citizenship, Corporate Sustainability, Philanthropy, Risk Management, Ethics, and related positions. An outstanding faculty of professionals from leading CSR and sustainable investment organizations will lead the interactive discussions which are a feature of the course. For more information about the course and to register, visit: http://bit.ly/RutgersCSR - CSRHub readers can enjoy 20% off using coupon code "CSRHUB20". Q: How is your day-to-day work related to the CSR Certificate Program? [BG] We support around 15,000 CSR professionals, more than half of whom are located outside North America. Our users include sustainability managers, consultant/accountants/lawyers and other advisors, academics, not-for-profit organizations, journalists, and activists. We provide these users with aggregated sustainability ratings on more than 17,000 entities—public companies, private companies, government agencies, and not-for-profits. Most of our users do not have formal training in sustainability. They have had to learn the contents of your program through experience (and probably by making a fair number of preventable mistakes!). Q: What can Rutgers course attendees expect to learn from your session? [BG] There has been a perception that corporate sustainability is not directly related to corporate profitability. We have done research that we believe shows there is a relationship between various aspects of sustainability and important drivers of business success. We will share some of the reasons we believe these relationships have not yet been fully appreciated and show where further research could be done in the future. Q: What advice do you have or opportunity that you see for attendees who complete the CSR Certificate Program? [BG] There is no clear career path yet for sustainability professionals. While people talk about “Chief Sustainability Officer” roles—very few of them exist in the US. So, sustainability professionals should be open to incorporating the tools they get from the program into general business practice. Being aware of sustainability opportunities should help them advance their careers towards other “V level” and “C level” positions. Once in these positions, they should be able to influence others in their management teams to share their interest in sustainability practice and bring its benefits into their organizations. Bahar Gidwani is Chief Executive Officer of CSRHub, co-founded by him in 2007. The organization provides CSR and sustainability metrics to corporate managers, professionals and researchers. These metrics are used to manage ESG, employment and community issues. There are more than 17,000 companies monitored by CSRHub and the “big data” results are sourced from more than 500 organizations. Before founding CSRHub, Bahar was CEO of Sonobyte Podcasting Voiceover Services; CEO of Index Stock Imagery; and Vice President, Kidder Peabody & Company. 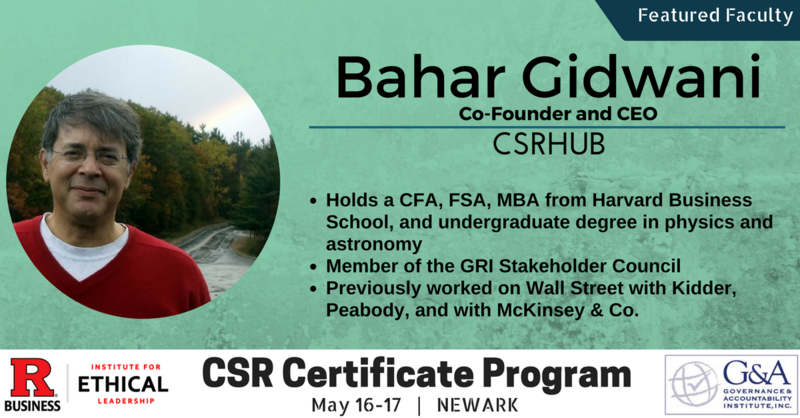 Bahar holds the MBA-Marketing from Harvard Business School (where he was a Baker Scholar); and a B.A.- Astronomy and Physics from Amherst College. He holds the Chartered Financial Analyst (CFA) designations (securities analysis) from the CFA Institute (Levels I and II); also, the FSI designation from the Financial and Sustainability Initiative organization. He is trained in Global Reporting Initiative (GRI) reporting.